To change your life, Apple has wonderfully crafted, the best gadget of the era the all new iPhone 6 with 4.7”-inch HD Retina Display, iOS8, A8 Chip, Finger print scanner, Apple Pay and 128GB memory. 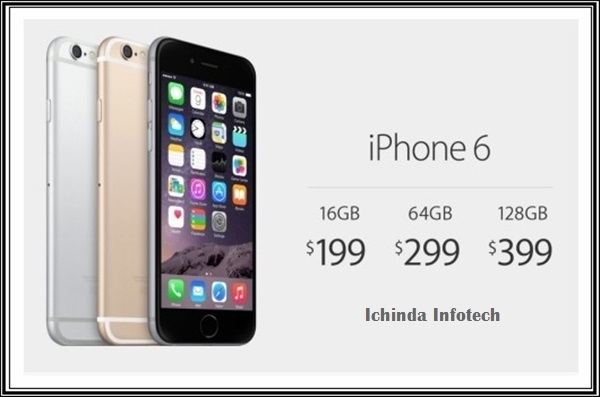 Now up for pre-order USA at Rs $199 for 16GB, $299 for 64GB and $399 for 128GB with contract in Silver, Gold, Space Gray slated to hit stores from 19th Sept 2014. The all new Apple iPhone 6 supports 4GLTE, Nano SIM, GPS, NFC, Fingerprint identity sensor offers you a 4.7-inch Retina HD (diagonal) LED-backlit widescreen Multi‑Touch display with IPS technology, 1334-by-750-pixel resolution at 326 ppi, 1400:1 contrast ratio (typical) for non-stop entertainment from watching movies to playing games powered by fastest A8 chip with 64-bit architecture, M8 motion coprocessor with 16GB/64GB/128GB variant runs on latest iOS8 with iCloud, Siri and iTune assures world class multi-tasking. This is not enough new iPhone 6 also combines 8-MP iSight rear camera with 1.5µ pixels, Autofocus with Focus Pixels, ƒ/2.2 aperture with 1080p HD video recording (30 fps or 60 fps) and 1.2-MP front camera with ƒ/2.2 aperture and 720p HD video recording to enhance your photography through smartphone. It also packed with a powerful Built-in rechargeable lithium-ion battery promising Up to 14 hours Talk time on 3G, time:Up to 10 days (250 hours) Standby time, Internet use: Up to 10 hours on 3G, up to 10 hours on LTE, up to 11 hours on Wi‑Fi, Video playback: Up to 11 hours and Audio playback: Up to 50 hours and weight is 4.55 ounces (129 grams) measures 5.44 inches (138.1 mm) x 2.64 inches (67.0 mm) x 0.27 inch. At last few honest word, the all new new Apple iPhone 6 is most innovative smartphone ever launched. What you think? Please be open to give your view.